So today has been a wonderful day in the Gonzalez world. Sal had to work on bills so he stayed back with the kids and let me go to the hospital early. The nurse that is on today is wonderful and she asked me right away if I wanted to hold Jaden. Of course I said yes. So I got to hold him for over an hour. You would not imagine how it felt. Then the rest of the family came and Ashley got really excited and asked if she could hold him. The nurse said yes right away as I was about to say no. (Thinking they would not want her to.) So Ashley got to hold him before daddy. How nice of daddy to let his daughter hold his son first. So Ashley held him for quite awhile and was so excited. She even kissed him. 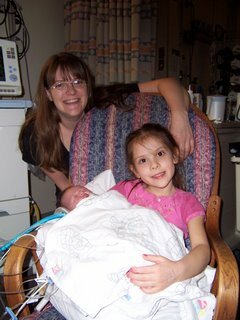 It was so exciting to see the joy in Ashleys eyes to hold her baby brother. We asked Ethan is he wanted to hold Jaden (while he was trying to pull all of his lines off) and Ethan said yes but he wanted to eat candy that the State Trooper and McGruff brought for them. We told Ethan he could hold his brother or eat candy. What do you think Ethan choose. For those of you who know Ethan really well, I am sure you guessed the candy. Ashley said she wanted to hold Jaden over getting the candy. How funny are they. So we will go back around 3:30 today and bring the kids to the supervised playroom and then finally daddy will get to hold his son. YEAH!!!!! He is very excited and I will post the picture of my movie stars. The pictures are not posting clear. I am sorry about that. Not sure why but fuzzy ones are better then nothing. What a great photo! It's great the kids can spend some time with their little brother, even if it is brief. 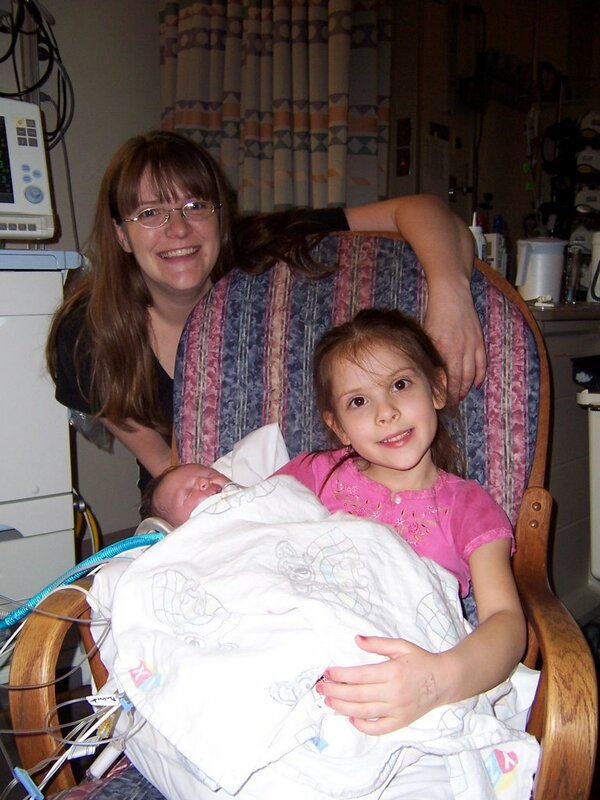 Time in the NICU can get long for the siblings- believe me, I remember those days all too well. I think of little Jaden often, and remember you all in my prayers. My best to all of you. That is such an awesome picture!! What a relief that you guys are getting to hold him. How is his temp? It will be so exciting for Sal to hold him too. Keep the pictures coming, I love to look and see what is new. I would also ask the if you can hold him, now that all of you have held him. the worst they will say is no. He is your son and you should be able to. Anyway, enough form the nurse.... Keep up the great jon keeping us posted!! Such an awesome picture, and how great is that - that you're all getting to hold him! But, like Krista said, you should be able to - especially his mommy & daddy! I really believe that sometimes that's the best medicine - he used to your voices and now needs to feel you close!! The pictures are very clear on my computer - no complaints here...They're "Picture Perfect!"